Does the name Baltic Sea bring to mind howling gales, freezing rain & U-boats? Well, we had two out of three of those at the Baltic Sea start today. Miserable conditions until the last 10K. I ran 65K in just over 7 hours, & crossed the line with my French friend J-B. Diana was an absolute trooper, picking up a flat in the early part of the race. 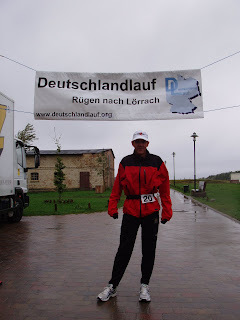 Thanks to Jan, her charm, die Polizei, Hertz, & a garage, she managed to avoid a DNF! 4am wake-up call tomorrow, followed by 80+K. It'll be interesting, after a tough stage today. Woo hoo! You have the first day under your belt. Hopefully the tough start will mean easier days to come. All is well in Austin. No cars driving into the side of the building so far this week. Congrats on getting started! I'm hoping it feels good to actually be doing this after so much training and planning. Don't worry, we're taking donations at the office to buy a weather machine that'll keep the wind and sleet away from you in subsequent stages. Yahoo! Day one is done! Now the fun begins right? U-boats? That's surprising...I didn't see that on the weather channel. Keep running!